There are 3 types of memories differentiated by the time lapse between the experience and the recall of that experience. Each type of memory activates a different brain areas when one attempts to recall it. Working memory resides in the frontal lobe of the brain and lasts less than a minute before fading. This form of memory is commonly referred to as one's attention span. Trying to memorize and dial an unfamiliar telephone number is an example of working memory. 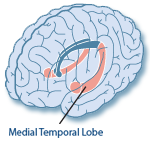 Short-term memory resides in the medial temporal lobe of the brain and lasts a few minutes to a few weeks before fading. When you try to recall a conversation or a phone number learned a few minutes to a few weeks ago, these brain areas are activated. Not all of one's moment-to-moment experiences are stored in short-term memory. Only those experiences that are novel, interesting or those that one intended to remember will sufficiently stimulate nerve cells in the medial temporal lobe to record them.